"By the liberation of our friends, W Lovett and J Collins, a new era in the march of infant liberty has commenced; the principles and conduct of these devoted men have already excited the bosoms of millions those feelings of gratitude and veneration, so beautifully expressed in the words of Job, 'When the ear hears them, it blesses them; when the eye sees them, it bears witness to them.' Their influence will call into action the elements of intelligence which the past year of seeming sleep has, like nature's winter, been preparing. Anticipation points us to the glorious position we shall occupy in a few months, when our present dignity shall be illuminated by the light that our liberated friends will throw upon it." Like all imprisoned Chartists and militants, the working class public saluted them and their victimized families. Upon John Collins' release from Warwick Gaol on Saturday 25th July 1840 a crowd of family, friends and well-wishers met him outside the prison gates. He and his friend and co-prisoner, William Lovett, were subsequently wined and dined by the Warwick Chartists. 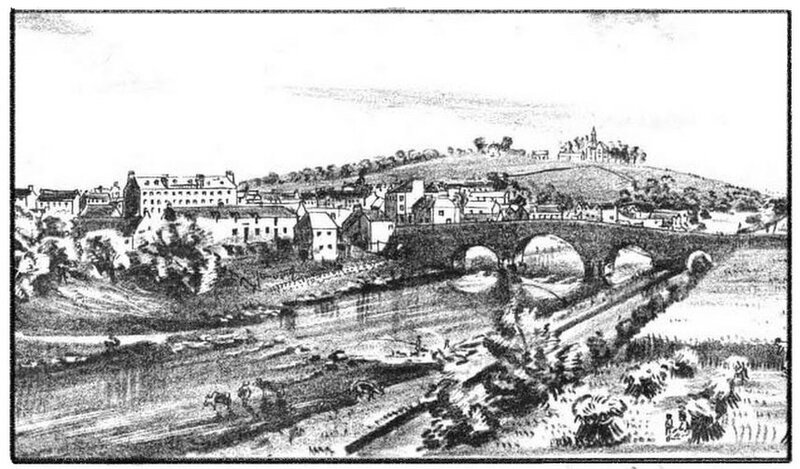 Later, the two men visited the Member of Parliament for Warwick who had championed their cause for better prison treatment; Lovett was seen off to London; and Collins and his wife and family were entertained by 120 dinner guests, including delegates from various towns, at the Saracens Head in Warwick. The following Monday Collins received a true hero's welcome when 70,000 people were said to have turned out to welcome him into Birmingham. ​The Commissioner of Police cooperated with the organizers and promised the police would not interfere with the welcoming demonstration so long as there was no disturbance. In Chapter IX of the "The History of the Chartist Movement" Robert Gammage wrote about the revival of agitation and the release of Chartist leaders, including a detailed account of John Collins' return to Birmingham. Following Collins' liberation from Warwick Gaol he did not retire from public life. He did not fall into decline or disappear. Nor did he lose faith or give up on his Chartist beliefs. Almost immediately he took up scores of invitations to attend meetings, soirees and dinners from places that wished to honour him and celebrate his release. In speeches he referred to his imprisonment only to illustrate government cruelty and oppression, and rather than dwell on himself he made the most of these opportunities to help revive the flagging Chartist Movement that had been laid low through the imprisonment and harsh treatment of numerous rank and file activists. "The whig-government have repeatedly boasted that they have put down the chartists; but it seems they have scotched the snake, not killed it. It [Chartism​] still preserves all the principles of vitality; and, in some parts of the country, appears to be determined again to bring them into troublesome action. In London, the release of John Collins and William Lovett from prison was made the pretext of public entertainment the other day, at which the Queen's health was received with hisses and uproar; .. .. At Birmingham, too, and Manchester, symptoms of a revival agitation are to be seen; .. .."
The Hull Packet - Friday August 21 1840. 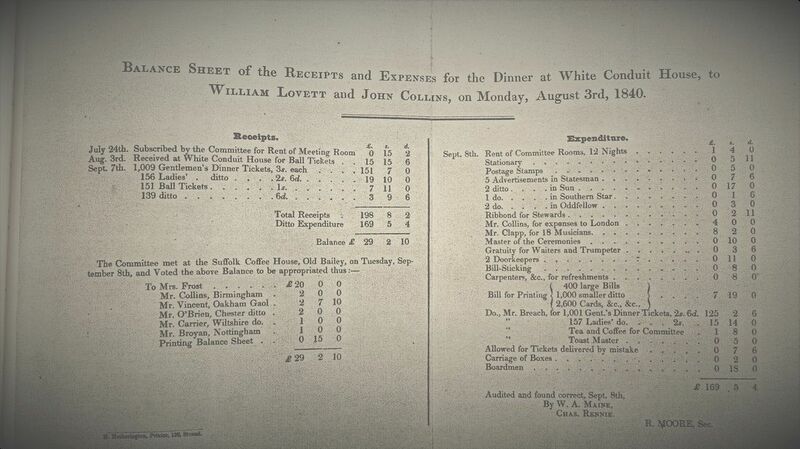 In August 1840 Collins and Lovett were honored at a dinner at the White Conduit House in London. It was an impressive event attended by over 1,250 guests including Members of Parliament Thomas Wakley and Thomas Duncombe whose efforts had helped bring about improved conditions for the two prisoners. Upon entering the room Lovett and Collins were hailed "with the most enthusiastic cheering and affectionate demonstration of respect and esteem...."
Not surprisingly, Collins had lost weight during his brutal twelve months' imprisonment, but in his usual self-effacing style he did not dwell on his own personal suffering. Instead he talked of his friend and co-prisoner's spirit and endurance. Collins pointedly told of the deceitful conduct of the Warwick Magistrates who had published outdated dietary tables and claimed the prisoners' petition regarding their treatment was greatly exaggerated. 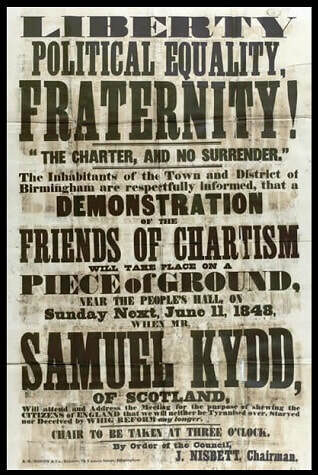 Within a month of Collins' release his influence and good judgement was felt when certain strange proceedings threatened to make a mockery of Chartist activities in Birmingham. Thomas Attwood's brother, Charles Attwood, who was dubbed the "hair brained theoretician," (British Workingclass Movement & Europe 1815-48, p 105 Weisser) called a public meeting at Holloway Head specifically to impeach the Foreign Secretary, Lord Palmerston, on charges of treason! It was a ridiculous charge, not least because it muddied the waters and detracted from the Chartist Movement. 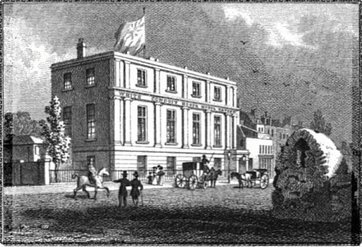 In spite of reported flattery and financial reward to join the Palmerston witch hunt, John Collins let it be known at a pre-meeting held on 8th August 1839 at Dee's Hotel & Posting House on Temple Row that he opposed the Palmerston action. 1839 Calling Card for Dee's Royal Hotel & Posting House. Courtesy Grace's Guide. In usual Collins' fashion he armed himself with facts and figures to refute the charges. On the day of the public meeting at Holloway Head he proved himself a strong-minded, independent thinker when he, and other influental Chartists, voiced opposition even though Charles Attwood asked him not to do so. When Attwood took his turn to speak the shout went up: "we don't believe you!" Attwood was defeated and a resolution was passed to agitate for nothing but universal suffrage. Such was the people's continuing trust and respect for John Collins. 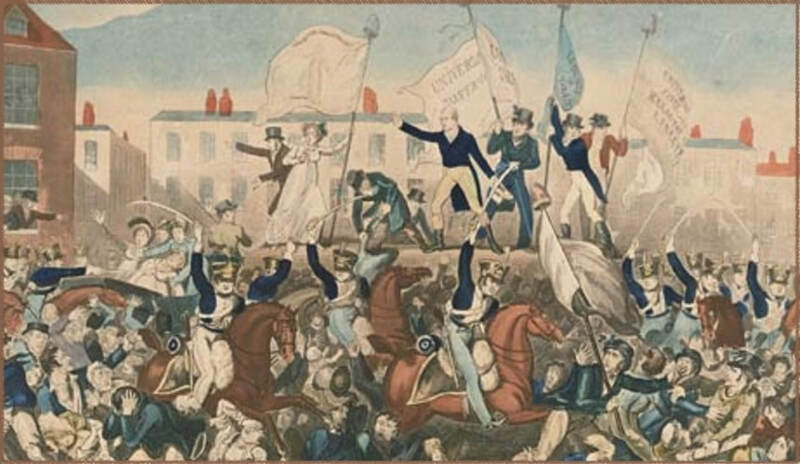 Chartism may have lain dormant while its leaders were imprisoned, but Collins' enthusiastic welcome on 15th August 1840 at Manchester (the site of the infamous Peterloo Massacre) proved the spirit of Chartism was alive and well. Collins and another newly released Chartist prisoner, Peter McDouall, were escorted in an open carriage and four horses by some 2,000 cheering supporters through the principal streets of Manchester and neighbouring Salford. The procession took about three hours, finishing at the Carpenters Hall on the Garratt Road where the two men addressed a huge assemblage. The Peterloo Massacre. Manchester magistrates called in the soldiery and on 16th August 1819 a sabre-carrrying cavalry killed eleven and wounded hundreds of townspeople at a peaceful demonstration calling for political reform. Collins brought forth gales of laughter and cheering when he referred to a Manchester newspaper he had read that morning that said "Collins was again blowing the dying embers of Birmingham Chartism to a blaze." To the delight of the audience Collins said if the display of support in Manchester was anything to go by it did not require much blowing on his part to blow Chartism in Manchester into a blaze! The next day McDouall and Collins received "a triumphal entry" into Rochdale, near Manchester. Knowing these two distinguished men would be in town caused great excitement near and far, and after arriving at the railway station McDouall and Collins were escorted in an open carriage through the town by the Radical Band and marshalls on horseback "amidst the cheers of the assembled thousands." When it came to Collins' turn to speak he said he was a working man having worked since he was eight years old, and he had done so ever since. He spoke eloquently of the suffering and starvation of the Birmingham people, of people he knew who died from the lack of the bare necessities of life, and inquests he had attended of people who had met the same ending. He said such events had led him to raise his voice against the state of affairs. That evening a meeting in The Theater was crammed full with boxes almost entirely occupied by well-dressed ladies. During his speech, Collins talked of the most harsh and rigid treatment he received in Warwick Gaol, and he relayed how his wife had not been allowed to give him a pocket handkerchief since it might give him some consolation in his dungeon. Yorkshire men were equally supportive, and even though their own chartist hero Feargus O'Connor was incarcerated in York Castle they made sure to recognize and welcome Collins and other Chartist ex-prisoners McDouall and White. ​In Leeds, a notice in the Northern Star informed the radicals and working men of that Yorkshire town there was to be a dinner honoring Collins and the others to be held in the Music Saloon at precisely 8 o'clock on the evening of 7th September. Headed "Universal Suffrage and No Surrender" the notice said the "Victims to the brutal treatment of the the cowardly and dastardly Whigs" had been released from their dungeons! ​Similar events were planned in Middleton, Bradford, Bolton, York and a dozen more towns. Advertisement for a dinner honoring Collins and others recently released chartist prisoners in Leeds on 7 September 1840. In mid-September when Collins was invited to Stockport in the county of Cheshire he met with local reformers at a Co-Operative Shop whilst his wife visited with other prisoners' wives. When it was time to attend the reception Collins was grandly escorted in a chaise, and upon arrival was greeted with much applause, cheering and other marks of esteem. There was a patriotic address in the flowery language of the day which was read on behalf of the inhabitants of Stockport and listened to in the utmost silence except for appropriate cheering. This was followed by a very personal and feeling speech in which Collins spoke from the heart. He talked of the distress and misery of the working class, and not knowing if this could be the fate of his own children, he had come out in the public cause - and he had done so knowing there would be a cost. He talked of his thoughts in prison about his wife, and urged the audience not to forget the wives and families of their own imprisoned townsmen because nothing more could ease a prisoner's mind than knowing his family did not starve. John Collins was no stranger to Scottish soil. Prior to imprisonment he had successfully campaigned for the suffrage and the National Petition in numerous towns and villages across the border. Nor had the hard working Scots forgotten him, and he soon embarked on a tour of Scotland where they celebrated him - and his wife - in the utmost style. [Northern Star 3 & 10 Oct 1840]. Greenock Hemmed in by the Scottish hill country, the fishing and ship building town of Greenock lay stretched out along southern shores of the River Clyde. It was a pleasant, sunny September morning, and as Collins and his wife arrived from Liverpool on the newly built steam-ship Actaeon, a wonderful sight greeted their eyes. A procession of thousands had traversed the whole town, a band from Renton had landed at the quay, and in front of the Customs House and far along the quayside it was densely crowded with people waiting to greet him. Once on land Collins gave one of many speeches in an event-filled day. Then the next day he and his friends from Greenock went onto Dumbarton for a demonstration and supper in the Vale of Levin. ​​​​​Dalkeith Edinburgh was followed by a visit to Dalkeith where Collins, McDouall and their wives were escorted in a carriage by a procession of trades people to the White Hart where there was a platform set up with the men's portraits and a banner that read "Collins the people's friend, McDouall the tyrant's foe." At Kilbarcan, there were too many people to fit into the hall of the Chartist Church to hear Collins and McDouall speak, that the Mason's Arms was opened up, and within a few minutes that too was filled. Consquently, the speakers divided themselves up, and as each finished his speech to the one meeting he retired to address the other meeting. Stirling A month later and Collins was still doing the rounds in Scotland. This time he was in Stirling near the iconic Battle of Bannockburn where the Scots won a key victory over the English long ago. ​In the hall of the Corn Exchange Hotel, with its six beautiful chandeliers and seating for several hundred men and women, Collins addressed a delighted audience "with his pointed remarks and humorous anecdotes." Bathgate Collins was indefatigable as the schedule for Bathgate indicates. He arrived at Linlithgow (birthplace of Mary Queen of Scots) by canal boat, walked to the Black Bull for breakfast, after which he took a "chariot" within three miles of Bathgate where he was met by a deputation of men and music who marched him into the town. There was a dinner laid on for him in the afternoon, at which he proceeded to give a lively and humorous speech. Then he went onto a soiree that night and more speeches ending at ten o'clock that evening. Blairgowrie Even when Collins was noticeably unwell he was determined to travel and attended a celebration in Blairgowrie, a town at the gateway to the Scottish Highlands. Like previous events, his reception at Blairgowrie was no less spectacular. 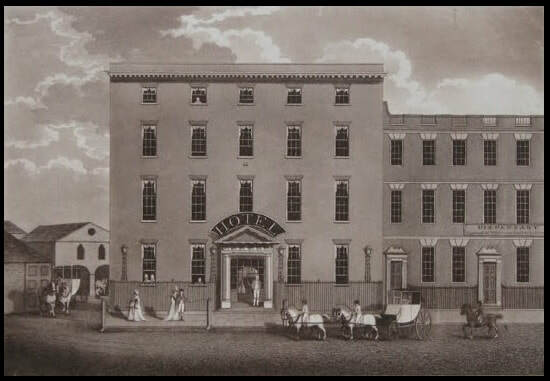 By prior arrangement Collins and fellow Chartist White arrived at the Wallace Hotel having traveled from Perth in the Defiance Coach. 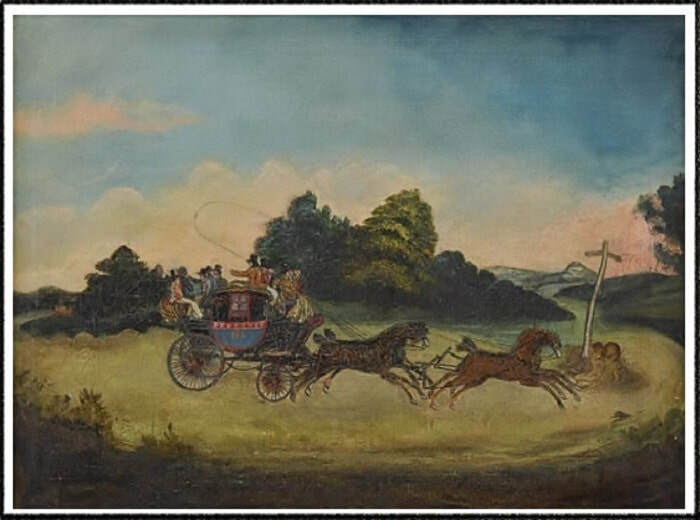 ​After dining at the Hotel they were taken "at a rattling pace" in a "handsome carriage and pair, with postilion in rich livery" to meet up with the procession. ​​People had walked a mile to greet the Chartist patriots, and upon Collins' arrival at Blairgowrie there were hearty cheers, a band of music, banners waving, and two Highland pipers who led the procession through the town and onto The Green. ​This was followed by the proverbial "soiree" held in the Hall of an impressive pile of new buildings lent for the occasion by one of the largest manufacturers in the area before an audience that included brawny Highlanders and wealthy businessmen! In Glasgow the reception in honour of Collins was quite extraordinary. Numerous groups had worked together, ensuring a wonderful welcome as thousands poured in from surrounding districts. In an amazing display, over 40 trades and bands from the area came out to greet Collins, his wife and another Chartist named White upon their arrival. People did not know much about White, but when the carriage opened up and Collins stood up the response was deafening. ​Crowds lined the road into the distance, and people swarmed around the carriage to shake Collins' hand and his lady wife. If there was ever any doubt that John Collins lacked a sense of humour, it could be laid to rest on this occasion when he reportedly said to the women vying for his hand that he wished they had one mouth so that he could kiss them all in one go - which brought forth much laughter and cheering! Following Glasgow yet another big demonstration was arranged for Collins and the other patriots at Newcastle. By now, however, ill health was catching up on Collins and he was unable to attend. During their imprisonment William Lovett and John Collins co-wrote a small book entitled "Chartism: A New Organization of the People." Published just after their release, the book recommended a grand design for the education and improvement of the people to be funded through voluntary public subscriptions - saying that for every working man unable to pay a penny-a-week there were "hundreds who waste that amount every week." The grand design included circulating libraries and public halls or schools to be used for infant, primary and secondary education, and in the evenings for public lectures, readings, music and other forms of adult recreation. 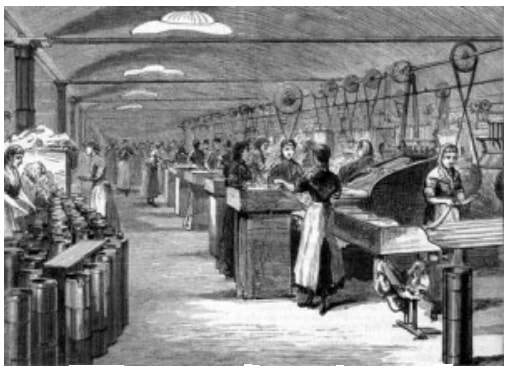 At the time, education to improve the lives of working people was thought by some to be politically dangerous, however, there were others who recognized the working man was oppressed and wanted more (W. Hawkes Smith, then Vice-President of the Mechanics' Institute in a letter to the Birmingham Journal). There were various education projects to address this need, and one was The People's Hall in Birmingham. "In 1840 a group of Birmingham artisans announced that they intended to build a People's Hall of Science on Loveday Street containing a library, a lecture room, school rooms, reading rooms, committee rooms, dinner and tea or refreshment rooms, and kitchen and other conveniences for the use and instruction and amusement of the people and the improvement of their understanding, morals and health and for promoting their rational enjoyments." ​According to the secretary of the group, The People's Hall was also to be used as a Female School for domestic instruction, in the hope of improving the home and discouraging the use of public houses and drinking gin! £1 shares were offered to the public (and could be purchased in weekly installments of six pence). Grounds for the People's Hall were secured on the corner of Loveday Street and Princip Street. In a letter to William Lovett, John Collins wrote he had been busy organizing the laying of the first stone for their People's Hall - and on Easter Monday 1841 (April 11th) the corner stone was duly laid by a Colonel T Perronet Thompson who told a crowd of thousands: "Birmingham had for years proved herself to be foremost in the great work of national amelioration, and he was delighted that the people had now set about, in right earnest, to erect a hall for the spread of knowledge." Among the groups in the procession that made its way from Newhall Hill to Loveday Street was the "Total Abstinence Chartists." However, in his speech, John Collins told those assembled at the site that "this was no sectarian society, and recognized no political or religious party. The Hall would be let to hire to all and every class who paid for it; and as the common object was instruction and improvement, he was sure, full and fair discussion between all parties who chose to use the hall, would produce the happiest results." Interestingly, and as an aside, there was feeling in Birmingham opposed to an outsider being engaged to lay the foundation stone of the new building. A letter from a shareholder published in the Birmingham Journal of March 1941 objects to strangers, and asks the Committee for the People's Hall: "Is there not one good man in this degraded town (Birmingham) who is worthy of this honour which has been conferred upon .... " and goes onto list well-known chartists Fergus O'Connor and William Lovett and parliamentarian Perronet Thompson. The writer finished by asking, " When will the eyes of the people again be opened upon their real friends - those friends whom the people destroyed?" One has to wonder if the writer was thinking the people's friend John Collins, or other former member of the Birmingham Political Union, would have been a more worthy choice to lay the foundation stone of a hall for the people. The People's Hall of Science was designed by Joseph Hansom (of Birmingham Town Hall and Hansom Cab fame), and the architect was William Ford of Birmingham. 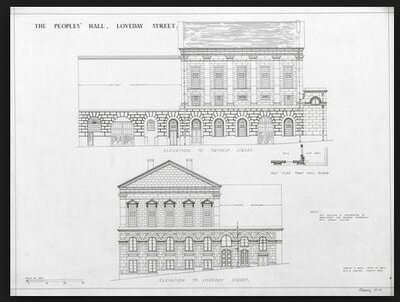 When the building was finally completed (there are several conflicting dates for this) on the corner of Princip and Loveday Streets, it was considerably scaled back from the original sketch, probably due to costs. 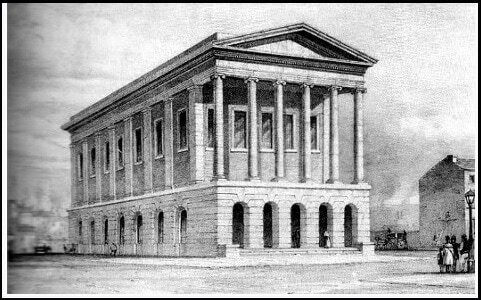 The Birmingham Journal said events were being held in the People's Hall in July 1843, and other reports indicate it opened earlier still. ​It cost £2,400 to build and was used for lectures, public meetings, trades and friendly societies, tea parties, etc at a low rate. At some point they tried concerts, but that failed to interest working people. 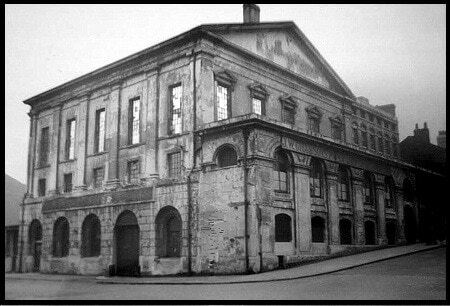 Another time it was used as a temporary place of worship until completion of the unitarian Church of the Saviour. ​In 1849 the People's Hall was sold (The Building News, June 1860) to a Mr Greenway for commercial use, its original purpose having been abandoned. It became known as The People's Hall Works. Later it was taken over by a Mr Gill. By 1840 Chartism had adopted a religious basis (some called it a divergance) that took hold in certain areas. In Scotland especially numerous Chartist Churches sprang up - including several towns where John Collins had visited before his imprisonment such as Dundee, Glasgow, Paisley and more. Collins was welcomed in their churches, and their success contributed to the formation of Chartist Churches in England [Chartism & The Church, Faulkner] including the first one in Birmingham. On a particular Sunday in October 1840, when it became known that Collins was to preach in a Christian Chartist Church in Scotland it was "crowded to excess" where he gave an excellent sermon. As "moral force" organizer behind the Great Glasgow Demonstration of May 1838 Collins developed a relationship with O'Neill, a member of the Church of Scotland's first Central Committee. In July 1840 O'Neill was sent to Birmingham to represent the Glasgow Chartists at the celebrations of Collins' release from prison. [Birmingham Journal, 1 August 1840], and O'Neill gave a rousing speech at Collins' celebration dinner. Later that year, when the two men met again in Glasgow, Scotland, Collins invited O'Neill to join him in running the Chartist Church in Birmingham [Looking at History, Richard Brown]. Not surprisingly, the Birmingham police kept tabs on Collins' activities following his release from prison. They reported secret meetings were held at his home that they were unable to infiltrate. In early December 1840 the Birmingham Commissioner of Police (F Burgess) informed the government Home Office in London that Collins was preparing to open a chapel on Newhall Street named the Chartist Christian Church and O'Neill was trying to recruit a congregation. A police spy (Constable P Pashley) attended the church on various occasions reporting on the proceedings, however, no attempt was made to interfere - in the words of the Commissioner - so long as Collins and O'Neill confined their meetings to their chapels [National Archives: HO 40/56]. In any event, the Newhall Street Church ​opened on 27 December 1840 and was the most famous of the Chartist Churches until it closed down several years later. The Church combined moderate, democratic thought together with knowledge, morality and temperance. Collins was not a member of the Teetotal Movement, but in the book he and William Lovett wrote they promoted temperance in the form of "drink free" halls and recreation. ​The Newhall Street Church had schools for children and young men, and also supported its own benevolent sick club (Historical Series #31 University of Manchester). It had a respectable attendance and was made up largely of upper working class artisans. The Chartist Church attracted the support of like-minded christians associated with the Chartist Movement such as Henry Vincent who was said to be a visiting preacher at the Chartist Church in Birmingham, and whose arrest in Wales helped contribute to the Newport Rebellion. One supporter called himself a 'Christian Socialist' [History of the Chartist Movement, J West]. ​Arthur O'Neill and John Collins ran the Birmingham Chartist Church on Newhall Street (O'Neill's story is told in The Chartist Prisoners by Stephen Roberts) and they and their church events frequently appeared in the newspapers. In February 1841 the local newspaper reported Collins chaired a Tea Party meeting at which the ladies of the church presented O'Neill with a fancy waistcoat, and on another occasion reported the church was so full that a number of females fainted during a funeral service! The first anniversary of the Birmingham Christian Chartist Church was celebrated in the Town Hall, with not less than two thousand present - of which there were many "well dress ladies" [Coventry Herald, Jan 7 1842]. The proceedings tell much about the support, harmony and character of the Chartist Church in Birmingham. Letters of congratulation were read out from radical members of parliament Sharman Crawford MP and Thomas Duncombe MP, and John Collins was appointed to the chair. He reported they had "six similar meetings in Birmingham" and twelve pastors. Joseph Sturge, the well-known Quaker, talked of the need for temperance and that "moral force" was better than "physical force" which received much cheering. A petition was approved to the Queen asking for clemency for John Frost who had been transported to Australia for his part in the Newport Riot. Arthur O'Neill gave a report that told of a healthy bank balance, a library consisting three hundred volumes, and that they had purchased a printing press and did all their own printing [Birmingham Jrnl, 27 Dec 1841]. The Christian Chartist Press was located at the church at 32 Newhall Street [National Archives HO45/261]. 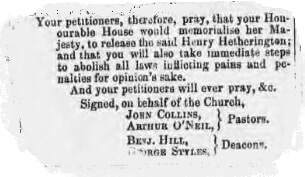 In March 1841 Pastors John Collins & Arthur O'Neill and Deacons Benjamin Hill & George Style of the Birmingham Chartist Church petitioned the British House of Commons calling for the early released of Chartist prisoner Henry Hetherington. He had been imprisoned for publishing blasphemous letters, the content of which the Chartist Church "highly disapproved" but nevertheless defended his right to freedom of speech. ​During the South Staffordshire colliers' strike of 1842, the Committee for collecting donations for the strikers sat in the Church schoolroom every evening, and in September of that year the Birmingham Chartist Church offered bail (which was turned down) for the Chartist prisoner, George White. O'Neill was subsequently arrested and imprisoned in August 1843 after attending a government-prohibited strikers' meeting at which he said he refused to pay income tax to a government that wasted money on wars. The Christian Chartists issued the above circular calling on the Trades to meet at the Church at 32 Newhall Street. Upon emerging twelve months later from Stafford Gaol, O'Neill resumed as pastor of the Chartist Church which had survived during his incarceration. However, in 1846 O'Neill and the congregation underwent a religious conversion, becoming a Baptist Chapel with premises on Livery Street. 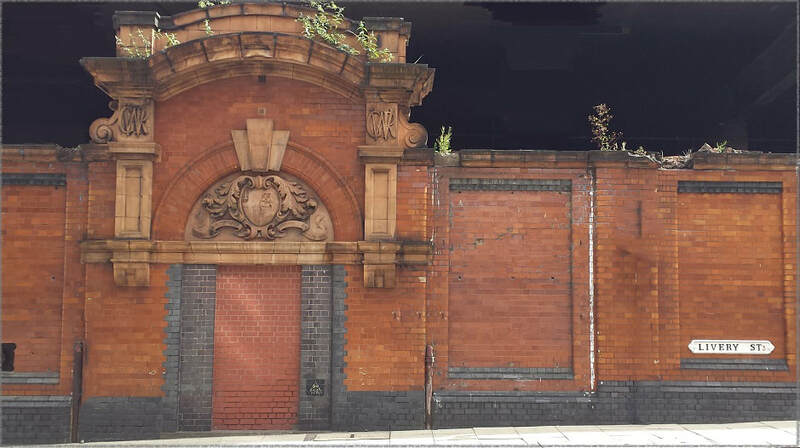 The following year they returned to Newhall Street joining up with Zion Baptist Chapel, at number 34½ on the east side of the street (Osbornes Guide 1838 and Kelly's Post Office Dir, 1878). The Chartist Church had finally ceased to be. With his involvement in the Chartist Church, John Collins may have appeared to have retreated from politics into religiosity. However, he had not turned his back on the working man and his right to vote. Nor did he shy away from speaking out against those with conflicting views, as the following exchange of letters during the winter of 1841 goes to show. He was convinced there should be Universal Suffrage (for the whole of the adult male population) as opposed to Household Suffrage (essentially limited to householders). Collins perceived Household Suffrage to be a compromise (not unlike the 1832 Great Reform Bill that gave the vote to the middle class but not the working masses), and akin to enfranchising the people by installments. As a result he at first declined an invitation from the Leeds Parliamentary Reform Association to speak at a festival the purpose of which was to bring together all classes of Reformers in a show of unity demanding Household Suffrage and the repeal of the Corn Laws. Following the exchange of letters (to the right), Collins and fellow preacher Arthur O'Neill did attend the Leeds Reform Festival on Thursday 21 January 1841, bringing with them much of the political weight of the Chartists of Birmingham who had publicly elected them. Marshall's Mill on Water Lane, Leeds. ​In spite of the above civil exchange of letters between Collins and the LPRA, there was an innate sense of mistrust on the part of working men for the middle class men who had organized the Leeds festival for "friendly debate" on the merits of Household Suffrage. ​Consequently, the leading Chartists of the day held a procession and counter-demonstration on Holbeck Moor at which resolutions were passed to continue agitation for the People's Charter and Universal Suffrage. So by the time the NPRA festival got under way at Marshall's Mill the crowd of several thousand was all fired up. The first speaker in favour of Household Suffrage, Joseph Hume the Member of Parliament for Kilkenny, was virtually drowned out by the working class element, and in typical John Collins' fashion he stepped forward on the platform and called on the hissing, hooting audience to give Hume a chance, saying: "Are ye men! If so, prove it by your conduct. Listen attentively." Amid applause Collins went on to exhort the meeting to "Hear every speaker." This was followed by silence for Hume to speak. Extract from John Collins' speech regarding America and its voting system. Following their release from Warwick Gaol, William Lovett and John Collins spoke at various public meetings of their intent to form a National Association of the United Kingdom as soon as their health and circumstances permitted. [Northern Star May 1st 1841] Accordingly, they wrote to the leading radicals and working men's associations in different parts of the country asking them to join in forming the proposed association based upon the plan set forth in their little work entitled Chartism (A New Organization of the People) including education and people's halls." The so-called "little work" was written in Warwick Gaol, and published after Lovett and Collins' release in 1840. The following Address is intended to be submitted to all the leading Chartists throughout the kingdom that we can have access to, in order to obtain their signatures, when it will be printed and published as their joint address; previous to which it will be considered a breach of honour for any individual to cause its publication. It is also intended that the persons signing it shall form a provisional board of management for six or twelve months, (as may be deemed advisable,) to aid in forming the association by the sale of cards, or otherwise, after which the board of management is to be elected by the members according to the rules and regulations. By returning this to Mr Lovett, 183, Tottenham Court Road, signed or otherwise, by return of post, you will oblige. The Address was headed "To the Political and Social Reformers of the United Kingdom - Brethren, in addressing you as fellow labourers in the great cause of human liberty, we would wish to rivet this important truth on your mind: You must become your own social and political regenerators, or you will never enjoy freedom." Meanwhile, a People's Hall along the lines recommended in Lovett and Collins' book was opened in Birmingham (Collins organized the laying of the foundation stone). It survived from approximately 1843 to 1849. (See above for more details on that.) Another such Hall run by William Lovett was opened in London from 1842 to 1857. In May 1841 a Chartist Convention was held in London, the purpose of which was to supervise the second National Petition including a petition for the release of political prisoners. Fergus O'Connor, the leader of the Northern Unions, was languishing in York Gaol, and yet he exerted control over the Chartist debate by publishing lengthy writings in The Northern Star. Unlike Lovett and Collins, when they were immured in Warwick Gaol, O'Connor was allowed access to the outside world through pen and paper. Thus he was able to shape and control the slate of Delegates who attended the Convention and were paid out its funds - with one exception. That exception was John Collins. Regardless of O'Connor's character assassination of John Collins, the people of Birmingham elected and paid him to represent them at the 1841 Convention. All went well for the first few days of the Convention during which time Collins and several other Delegates canvassed a long list of Members of Parliament for their support for the second National Petition. However, O'Connor wanted democracy on his terms. He could not tolerate independent, free thinking individuals such as William Lovett and John Collins. Subsequently, O'Connor's henchmen, led by Peter McDouall, went on a relentless pursuit to disqualify and eject Collins from the Convention using minor technicalities to discredit his so-called attendance "credentials." Some of the more moderate men supported Collins. They knew him well and agreed his services to the Convention were invaluable. 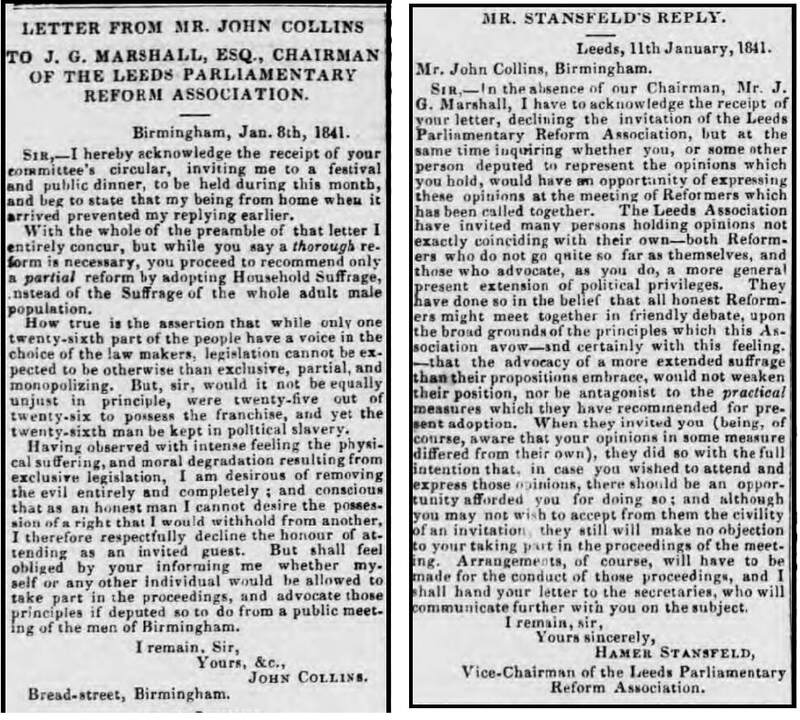 Nevertheless, they were out voted in three separate resolutions, and Collins was out manoeuvred in spite of being democratically elected by the people of Birmingham [Northern Star, 15 May 1841]. In early April 1842 a newly formed organization, the Complete Suffrage Union, held its first Conference in Birmingham. Instigated by Quaker and Alderman Joseph Sturge, the CSU was another short-lived attempt to unite the middle and working classes in seeking parliamentary reform through peaceful means. Dozens of Delegates from towns across the country, including Lovett, Collins, O'Neill and Vincent representing the Chartists, attended the Conference. Collins - who was now considered a Christian Chartist (The Chartist Movement, Hovell p 203) - was one of the few working men amongst a largely middle class contingent, and early on in the proceedings he was swift to defend the working class whom many had spoken against. Collins said he had never been accused of being a violent man, but he felt more able than some to address the subject. He said working men who resorted to physical force against the unfair political system should not be judged so harshly, and went on to cite a number of reasons - not least of which was a lack of education. Collins also addressed the Conference regarding the need for the secret ballot and the right of men to vote regardless of their ignorance or virtue. There was considerable discussion on annual parliaments, of which John Collins remained a great advocate. By the end of the Conference, the Delegates had essentially agreed on the same six points as The People's Charter (but not the name itself) including the right of every man 21 and of sound mind to vote, the secret ballot, equal electoral districts, abolition of property requirements for Members of Parliament, remuneration for those MPs; and annual parliaments. 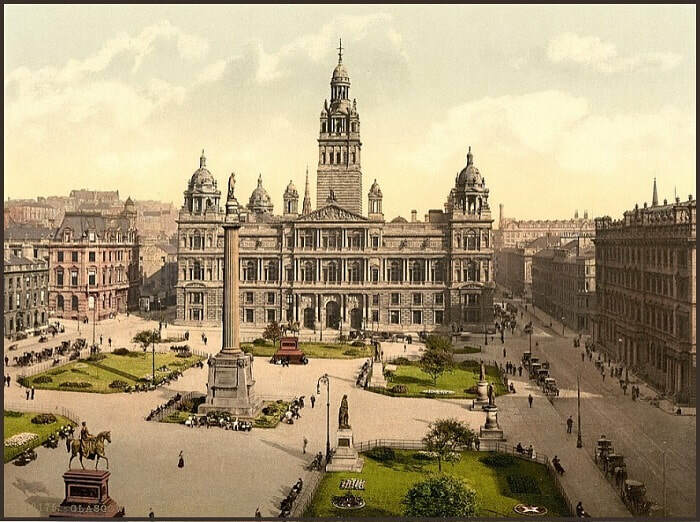 Throughout 1842 John Collins lectured in support of complete suffrage in many towns in England and Scotland including Glasgow's city hall (before 1,200 and several town councilors), Paisley (2,000 in attendance), and in Pollockshaw where Collins spoke in "his best style" and a Complete Suffrage Association was formed. Meanwhile, Fergus O'Connor, a demagogue who persistently wrested leadership of the Chartist Movement from potential rivals and competitors, insinuated the members of the CSU had dishonest intentions and in particular denounced its leader, Joseph Sturge, as "cunning tool." [Memoirs of Joseph Sturge by Henry Richard] In typical soap-box fashion, O'Connor called the CSU "the Complete Humbug." ​​Meanwhile, in the summer of 1842 the second National Petition in favour of The People's Charter was presented and rejected by the House of Commons. During parliamentary debate it was clear the Petition was damned by its association with Fergus O'Connor who was described as a "malignant and cowardly demagogue." 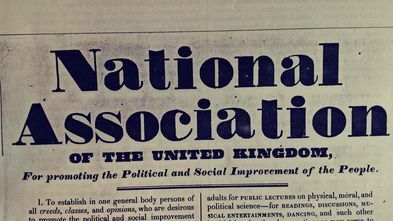 The failure of this (second) National Petition was followed by numerous local disturbances in Birmingham, and the Complete Suffrage Union met to consider what to do next. John Collins made a motion that a memorial on behalf of the CSU should be sent to the Queen complaining of a government that kept the price of food high and wages low; that sanctioned wars and burdensome taxes; that ignored the sufferings of the people; and rejected the Petition signed by millions of the industrious population. In October, at a CSU meeting in Edinburgh, honouring Sharman Crawford MP, John Collins addressed the meeting regarding the supposed lack of education of the people which the government used as an excuse to shut them out of the voting process. 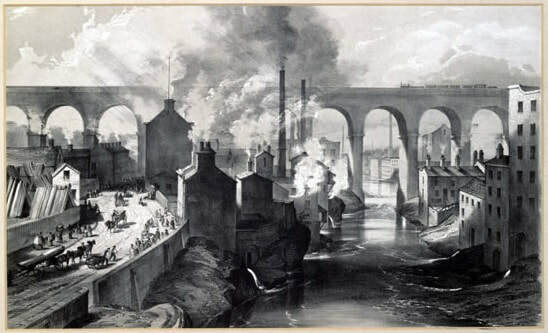 Collins said on his way to Edinburgh he stopped at a town of about 6,000 where the average man earned 7 to 12 shillings a week, and yet out of that miserable sum they maintained five reading rooms, and took in over 80 newspapers and other publications. When the Complete Suffrage Union met again in Birmingham in December 1842, the conference broke down over the adoption of a name for the document embracing the six points of reform previously agreed on. The middle class members of the CSU refused to accept the term "People's Charter" with its association of violence. 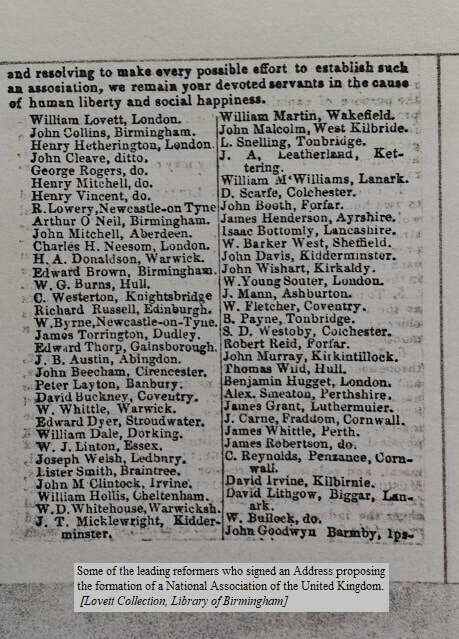 The Chartists members including Lovett and Collins refused to give it up [Leeds Times May 8 1841] since the name represented a movement largely made up of working men, of whom many had gone to prison for it. Lovett left the Union, but Collins continued to be loosely associated with it. At a CSU meeting on 22nd May the following year to discuss the state of constituency in various boroughs in the Midlands, Collins informed the meeting "he knew a little about Warwick" (which caused much laughter since he had been imprisoned there) and he said that although they had no hope of returning two suffrage candidates for the borough of Warwick they ought to contest it as they had one good man already. However, following the breakdown of the CSU conference in Birmingham in December 1842, the Complete Suffrage Union disappeared into mainstream radical activity. The winning of the broad franchise was growing ever fainter since the middle and working classes were unable to unite [Life of Thomas Cooper, T Cooper] in the common cause. During 1842 there was a shift in John Collins' focus as he moved away from front line Chartist activities. For all that, Collins was still on the side of the working man. In February at a weekly meeting of the Birmingham Anti-Corn Law Association, chaired by the Mayor, regarding the repeal of the Corn Laws and Monoplies, Collins seconded a resolution to send an Anti-Corn Law petition to the House of Commons (Modern Birmingham & Institutions, A Langford, P 79). By 15th October his focus had shifted even more to localized affairs when he addressed a Town Hall meeting and spoke out against a proposed Church Tax of sixpence in the pound - which was subsequently defeated (Modern Birmingham & Institutions, A Langford, p14). In June 1845 Collins attended a public meeting convened by the Mayor to discuss a resolution to bring together various local government boards under one entity, including a new committee to orchestrate that transfer of power. As a speaker in favour of the amalgamation Collins suggested an amendment that "every householder" be included in the instruction of said committee. Not surprisingly, when put to the vote the amendment lost by a large majority, though the original resolution was subsequently passed (Aris's Birmingham Gazette, 2 June 1845). Collins expected too much of the middle class Town Councillors who did not want input or interference from working class householders. No doubt Collins learned from that experience. ​In July 1846 we see evidence of Collins' diplomacy when he attended a dinner for sixty or more at the Grand Turk on Ludgate Hill in Birmingham to celebrate the passing of a ministerial free-trade measure. At the request of the chairman, John Collins made the toast of the evening to "Sir Robert Peel, the greatest benefactor of the country." Collins went onto adroitly ​explain his reasons for the toast, which he would have considered an insult or a joke three or four years before (Aris's Birmingham Gazette, 6 July 1846). Peel had previously been against the repeal of the Corn Laws. Later that year, Collins attended a Town Hall meeting regarding the financial difficulties of the Queen Elizabeth Hospital in Birmingham. He was the first of several speakers calling on those present to pledge their financial support, and in his usual way was well armed with information regarding the hospital's state of affairs. "Mr John Collins rose to move the first resolution. He commenced congratulating the Chairman on presiding at the meeting called for so excellent a purpose, and also expressed his delight at seeing so many of his fellow-workmen present. That however was no more than he expected, for he knew the benevolence of the men of Birmingham, and that they all contributed towards a good object so far as their means allowed them. "Hospitals they were aware, were erected for the reception of persons afflicted with disease, or who met with serious accidents in following their trades Those noble institutions afforded them relief from mental anguish, and removed their disease. He knew several individuals who had been obliged to have recourse to the Queen's Hospital, and they all spoke in the highest terms of the kindness and attention paid to them by the officers, who at the same time regretted that, from the confined state of the funds of the institution they could not not, in some instances, order for them things which were indispensably necessary. "He felt sure that the working classes would not suffer such a state of things to continue. He found that during the four years the hospital had been in existence 14,376 cases had been registered - and for the first six months no register had been kept. "He found also that the medical and surgical officers had given up no less a sum that 2220 shillings of their fees, for which the public owed them a deep debt of gratitude. "Mr Collins concluded by moving a resolution recognizing the utility of hospitals, regretting the state of the Queen's Hospital and pledging all present to support it." ​ (Aris's Birmingham Gazette, 30 November 1846). Collins' honest character and his concern for public spending resonated with the people of Birmingham who knew him from his "Chartist Days," and in 1847 he was elected ​Town Councillor for the Ladywood ward of Birmingham. That same year he was Deputy Chair on the General Committee in Birmingham promoting Muntz and Scholefield as the "only Reform Candidates" for Parliament. Both were subsequently elected Members of Parliament for Birmingham. There is a commonly held mistake that John Collins was a shoemaker. Hovell does so in The Chartist Movement, and Allen and Ashton in Papers for the People. It probably came about from some earlier source which has since been repeated, so this might be a good time to make a correction. Like his father before him, John Collins was a Toolmaker. Warwick Gaol records confirmed his trade, as well as the book he co-authored with William Lovett Chartism: A New Organization of the People. Collins worked at the Gillott Steel Pen Manufacturing Company for several years, confirmed by Joseph Gillott at Collins' trial in 1839. Collins was a paid lecturer in the early years of the Chartist Movement, as well as a Sunday School Teacher at the time of the National Convention of the Industrious Classes in 1839. Following his release from Warwick Gaol in 1940 Collins continued to attend meetings and give public lectures on Chartism. He was a pastor at the Christian Chartist Church in Birmingham. In 1847 John Collins was elected Town Councillor for Birmingham, which gave him an opportunity to help curb council spending. ​The following year he was renting premises on Livery Street for the purpose of carrying on business as a Grocer and Provisions Dealer for which the well-known Chartist, Feargus O'Connor accused Collins of joining the middle classes! By 1851 Collins was in decline and no longer able to do business because of illness. ​John Collins had been many things since his days as a journeyman Toolmaker but there is no evidence he was ever a shoemaker. ​- Use the Menu Bar at top of each Page to follow the John Collins' story in chronological order. - Go to the Content Page to browse all the Pages on the entire website. - The Welcome Page gives an overview of the life and times of John Collins. I recommend you start there. - The purple button will take you to the top of this Page.